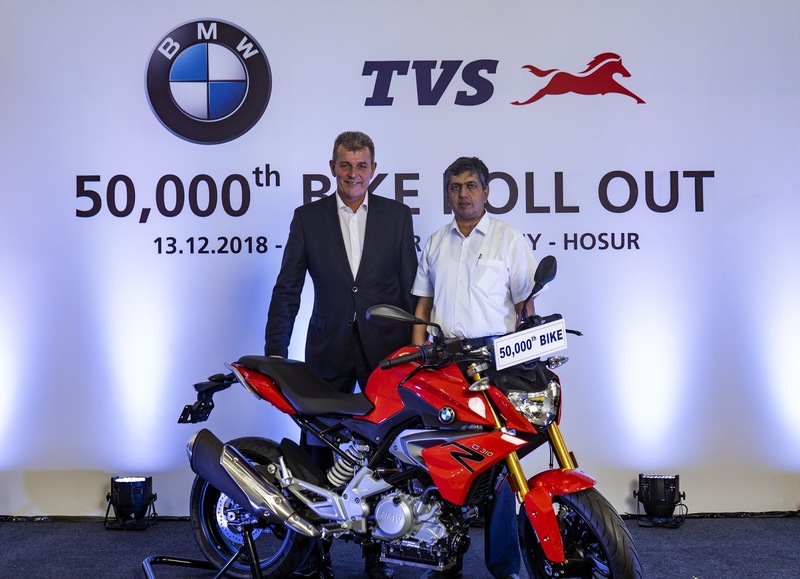 TVS Motor Company, a reputed manufacturer of two-wheelers and three-wheelers in the world, today, rolled out the 50,000 unit of the BMW 310cc motorcycle. The motorcycle was rolled out from the Hosur plant of the company in the presence of Dr. Markus Schramm, Head of BMW Motorrad, and Mr. KN Radhakrishnan, Director & CEO, TVS Motor Company. In April 2013, TVS Motor Company and BMW Motorrad signed a long-term strategic partnership to manufacture sub-500cc motorcycles for the globe. This collaboration has resulted in the launch of three products on the 310cc platform namely BMW G 310 R, BMW 310 GS and TVS Motor Company’s TVS Apache RR 310. The exports for these two BMW Motorrad models, BMW G 310 R and BMW 310 GS, commenced in December 2016 and today, they are being offered in more than 90 countries.